Here at GuidoMaggi we know how important it is to look tall and that’s why we handcraft a luxury range of 5 and 6 inch boots in a variety of styles, designed to suit every aspect of your life. Our Italian elevator boots are shoes that make you taller without sacrificing quality or style, so you can have tall men shoes that boost your height as well as keep you on trend. Our NoLita elevator boots are the perfect footwear for discreetly adding height, while at the same time keeping you feeling comfortable and looking sleek. 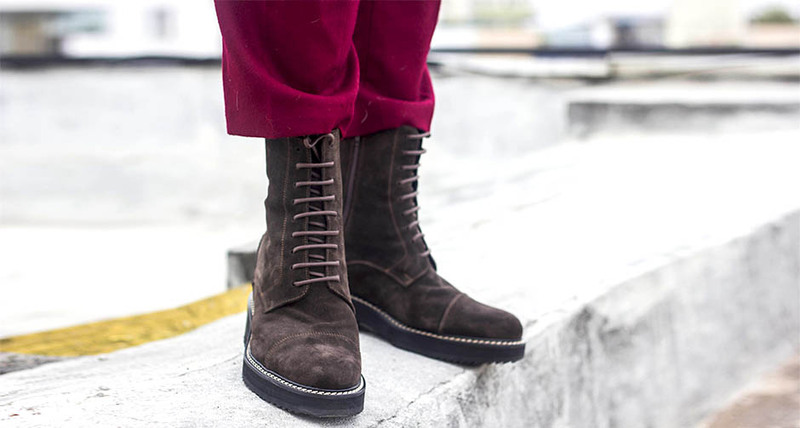 These functional lace up boots feature a chic brown calfskin suede upper and a soft goatskin leather lining and insole for optimum comfort. The handcrafted anti-slip rubber sole makes these a great choice of elevator shoes for all seasons and the best part is, you can customize them in your choice of heel height. With the NoLita you can choose various increments in height from 4 inches up to 6 inches, so you’re really going to get that boost in height that you desire. And all the better that it will be in a casual, versatile boot that will quickly become your new favorite pair of shoes. Plus, these are the perfect combination of rugged and elegant that will look super slick with your jeans. If you’re looking for a stylish boot that will not only enhance your outfit but add up to 6 inches to your height, then the Cologne is the ideal boot for you. These chic elevator shoes will look fantastic with a suit or keep it casual and team them up with your jeans and an Oxford shirt. Shoe lifts for men don’t have to be noticeable and in these sophisticated Cologne boots nobody will ever know your height is in your shoes. You can tailor the boots to your liking, to give you just the right amount of height, anywhere from 4 inches up to 6 inches, all packaged discreetly within the boots. The leather and suede upper gives these boots their elegance and the rubber sole makes them ideal for winter. So whether you wear them to work or on a date, you’ll know you will look both tall and sophisticated at all times.